Chances are you've bumped your head before. Often, the injury is minor because your skull is hard and it protects your brain. But other head injuries can be more severe, such as a skull fracture, concussion, or traumatic brain injury. Head injuries can be open or closed. A closed injury does not break through the skull. With an open, or penetrating, injury, an object pierces the skull and enters the brain. Closed injuries are not always less severe than open injuries. 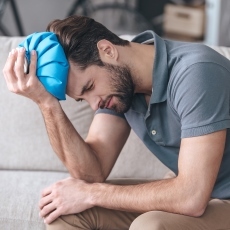 Some common causes of head injuries are falls, motor vehicle accidents, violence, and sports injuries. Doctors use a neurologic exam and imaging tests to make a diagnosis. Treatment depends on the type of injury and how severe it is.